Music by Samuel Vriezen, Lauren Redhead and Gregor Forbes alongside exciting new GEMS commissions by Patrick Shand and Jolon Dixon. Glasgow Experimental Music Series presents ‘Artisans of Piano Music’, an intimate concert programme of uniquely crafted piano pieces by several highly individual composers: from delicately formed curiosities by Lawrence Dunn, Alex Nikiporenko, Emily Doolittle and Gregor Forbes, to Juta Pranulyte’s intense process piece about concentration, acoustical perception, and failure. Nestled between these are several pieces from Henry McPherson’s stunning and poetic Book of Trees and his recent graphic scores, and, to conclude, short compositions by Linda Catlin Smith and Jürg Frey. Composer-performers Rory Comerford and Gregor Forbes have been collaborators since the very first Glasgow Experimental Music Series performances in 2014-15 and are now joining again for this hugely varied programme of adventurous new compositions. Opening with the second of Louis d’Heudieres’ radical audio-score series ‘Laughter Studies’, the concert goes on a fascinating journey through Comerford’s latest work, ‘Meditation no 2′, pieces by Christian Wolff, Peter Ablinger and Eva-Maria Houben, and finishes with the new trio redux version of Forbes’ ‘Infinite Avenues’. Glasgow Experimental Music Series returns to The Pipe Factory with a specially devised performance exploring the dynamics of group interaction and the limits of acoustical perception. Presented as a continuous theatrical show, Cross / Bend / Canvases features vivid and extreme new process pieces by Juta Pranulyte, benchmark group decision-making pieces by James Saunders, and Gregor Forbes’ open-form cello concerto ‘Canvases’. This concert is the biggest in the Glasgow Experimental Music to date, featuring around 20 musicians and including four world premieres. More than ever before, the heirarchical and collective aspects of music reflect the pressing need to speculate about our social and political identity as human beings. Cross / Bend / Canvases is a performance devised to witness such speculation rendered in the colours and intensity of sound. 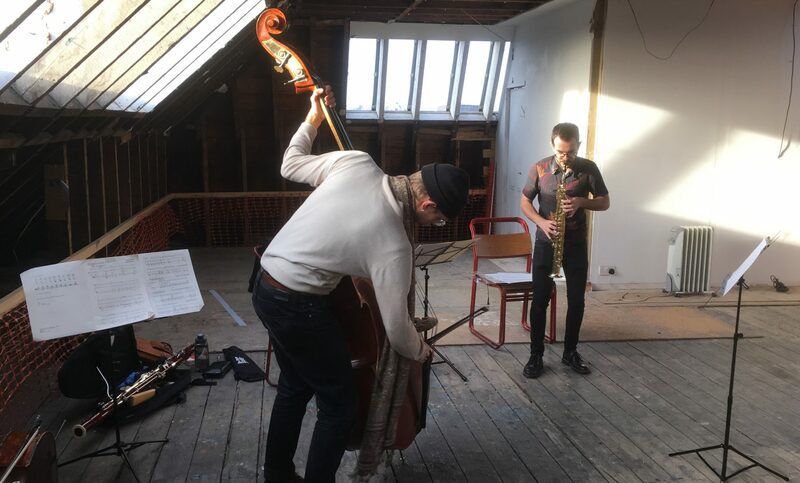 After three years, Glasgow Experimental Music Series returns to The Project Cafe with a programme of fresh new music by local composers and friends, performed by adventurous Glasgow-based instrumentalists Adam Hall and Gregor Forbes. Come and hear the bright colours and simple forms of Laurence Crane’s ‘Jurgen Hip’; the serene mysteries of music by Alex Nikiporenko, Eva-Maria Houben and Tim Parkinson; the bird-song sonorities of Emily Doolittle’s ‘Utah 1996’ for solo cello; and the playful wit of compositions by Gregor Forbes. “I have found it a singular luxury to talk across the pond to a companion on the opposite side.” Henry David Thoreau, Walden. An hour-long immersive concert-installation performance of John Cage’s Music for Piano – one of the most significant early scores of indeterminate music, in which sounds are based on imperfections on sheets of paper – interspersed with Cage’s stunning, austere Winter Music. Playing on two pianos separated at each end of the Ledger Recital Room, and with the audience seated or slowly moving around in between, Keesia and Gregor will create an enveloping sonic experience of colliding tones and spacious silences. Compositions by Rory Comerford, Gregor Forbes, and Aran Browning.